My search ultimately led me to conclude that the biblical account was absolutely accurate and that God did not expect me to believe in something that was counter to the rational evidence all around me. I spent my career as a nuclear physicist at the Los Alamos National Laboratory and the Fermi National Accelerator. Now in my 60s, God has placed me in a unique position here at the Institute for Creation Research to further dispel the common notion that radioactive dating somehow proves the earth is billions of years old. The detailed investigation presented in this series provides a compelling case that radioisotope dating does not prove that the earth is old as is routinely taught in schools throughout our country. * Boyd, S. W. 2005. Statistical Determination of Genre in Biblical Hebrew: Evidence for an Historical Reading of Genesis 1:1–2:3. In Radioisotopes and the Age of the Earth: Results of a Young-Earth Creationist Research Initiative. Vardiman, L., A. Snelling, and E. Chaffin, eds. El Cajon, CA: Institute for Creation Research and Chino Valley, AZ: Creation Research Society. This study is available at www.icr.org/rate. Past articles in this series have attempted to establish a foundation for understanding the radioisotope dating models or hypotheses, their assumptions, and how those assumptions lead to a “deep time” picture of our universe.1 Secularists would have us accept their convoluted, circular arguments as scientific fact simply because the majority of people in the academic community embrace them. Hopefully our readers now understand that using the various types of radioisotope decay as clocks does not consistently produce concordant results, nor is it verified by observational evidence. If these radioisotope decay methods do not properly date rocks of known ages, how can we trust them to date rocks of unknown ages? Trusting these methods to give factual dates would then be a matter of faith, not science. What secularists are trying to instill in us is a strange amalgam of science and their biased philosophy known as secular humanism. Dating methods using the rare-earth elements are not used as frequently as the potassium-argon (K-Ar), argon-argon (Ar-Ar), rubidium-strontium (Rb-Sr), uranium-lead (U-Pb), and lead-lead (Pb-Pb) methods and are somewhat hidden from general knowledge. 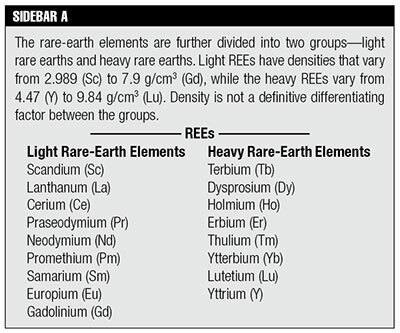 The rare-earth elements (REEs) are a group of seventeen metallic elements—i.e., the lanthanides plus scandium (Sc) and yttrium (Y)—that tend to exhibit similar chemical properties and tend to appear in the same ore deposits. They are relatively plentiful in the earth’s crust but are so dispersed they are not often found in concentrations that make the ore deposits economically extractable. Thus, the term “rare earths” is archaic and dates back to the discovery of the black mineral ytterbite (later renamed gadolinite) in 1787 at a quarry in Sweden. Rare earths open a new regime in radioactive dating. In previous articles we dealt with parent-daughter decay schemes where the parent and daughter exhibit different chemical characteristics.1 When they react with other elements, REEs generally form ions with a charge of +3. Their atomic radii decrease with increasing atomic number (Z) from 1.15 Å in lanthanum (Z=57) to 0.93 Å in lutetium (Z=71). This small size makes the REEs even more mobile during rock formation (crystallization) than either Rb (1.48 Å) or K (1.33 Å). Because the REEs preferentially exhibit +3 ionization states and have small ionic radii, they can only be absorbed into the structure of certain minerals. Feldspar, biotite, monazite, and apatite tend to concentrate the light REEs, whereas pyroxene, amphibole, and garnet tend to concentrate the heavy REEs. 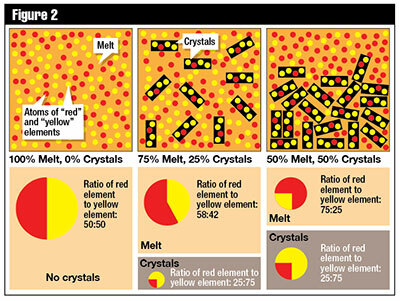 The concentrations of Sm and Nd in silicate minerals increase with the order in which they crystallize out of magma. Measurements of the ratios of Sm to Nd concentrations in various minerals and rocks verify this expected trend.2 Since Sm+3 (1.04 Å) has a somewhat smaller ionic radius and thus a stronger ionic potential energy, it will bond more tightly to a mineral matrix and tend to precipitate out of a magma before Nd+3 (1.08 Å). 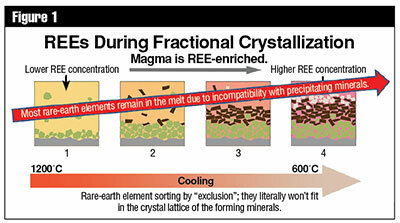 This can lead to crystal fractionation, which is one process by which different rock compositions can be generated from a single-parent magma in a rock formation without appropriating radioactive decay as the agent of change. Figures 1 and 2 provide basic visual illustrations of this process. Samarium decays to neodymium via alpha decay with a half-life of (1.06 ± 0.01) x 1011 yrs.3 It is interesting to note that two other radioisotopes of Sm,146Sm and 148Sm, have very long half-lives, (1.03 ± 0.05) x 108 yrs. and (7 ± 3) x 1015 yrs. respectively, and also decay by emission of an alpha particle. 146Sm is not used in dating because it only occurs naturally in trace amounts, and 148Sm is not used because its half-life is simply too long—i.e., it does not produce enough decay products for them to be measured. It should be noted that a recent paper4 used a direct comparison method between the activities of 146Sm and 147Sm in activated samples of 147Sm to obtain the half-life of 146Sm. Previously, the half-life of 146Sm had been quoted as 50 Ma, 74±15 Ma, and 103±5 Ma by various authors.4 At the time of this measurement the accepted value was 103±5 Ma, yet the latest result showed a half-life of 68±7 Ma. Since the half-life of 147Sm was used in determining the 146Sm half-life from the measured isotope ratios and activities, this casts serious doubt on the accepted half-life of 147Sm and the dates determined using the 147Sm-143Nd decay clock. Lutetium decays to hafnium via beta (β-) decay with an uncertain half-life; estimates range from 2 to 7 x 1010 years. As with all of the extremely long-lived isotopes, it is quite difficult to directly measure the infinitesimal amounts of daughter isotope produced in their decay during a human lifetime. Not only is direct measurement challenging, but the small amounts of decay products (on the order of 2% of the parent concentration for objects that are the secular age of the earth) are especially susceptible to small variations from other processes such as cosmogenic production, magma mixing, contamination, errors in estimating primordial abundances, hydrothermal transport, and fractional crystallization. Thus, quantitative values for their half-lives rely heavily on analyses of rocks having a known age. This is circular reasoning at its best! We will continue this discussion in next month’s issue. Click here to read “Radioactive Dating, Part 1.” Click here for Part 2. Click here for Part 3. Click here for Part 4. Cupps, V. 2014. Clocks in Rocks? Radioactive Dating, Part 1. Acts & Facts. 43 (10): 8-11; Cupps, V. 2014. The Iconic Isochron: Radioactive Dating, Part 2. Acts & Facts. 43 (11): 10-13; Cupps, V. 2014. The Noble Clock: Radioactive Dating, Part 3. Acts & Facts. 43 (12): 10-13; Cupps, V. 2015. Alkali Metal Dating, Rb-Sr Dating Model: Radioactive Dating, Part 4. Acts & Facts. 44 (2): 10-13. Faure, G. 1986. Principles of Isotope Geology, 2nd ed. New York: John Wiley & Sons, 201-202. ICRP. 1983. Radionuclide Transformations—Energy and Intensity of Emissions. ICRP Publication 38. Annals of the ICRP, 11-13. Kinoshita, N., et al. 2012. A Shorter 146Sm Half-Life Measured and Implications for 146Sm-142Nd Chronology in the Solar System. Science. 335 (6076): 1614-1617. Cite this article: Vernon R. Cupps, Ph.D. 2015. Rare-Earth Clocks, Sm-Nd and Lu-Hf Dating Models: Radioactive Dating, Part 5. Acts & Facts. 44 (3).